Almotamar.net - Yemen and Germany signed in the German capital Berlin Thursday endorsement documents of an agreement on encouraging and protecting investment between the two countries. The documents were signed for the Yemeni side by the ambassador to Germany Mohammed Lutuf al-Eryany and for the German side by its Minister of state for Foreign Affairs and the signing ceremony were attended by the Yemeni Foreign Minister Dr Abu Bakr al-Qirbi. 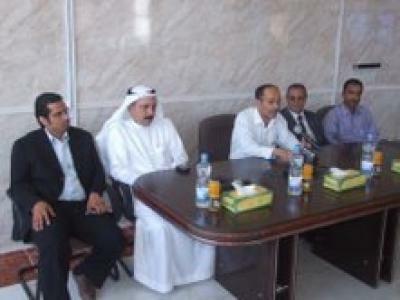 Almotamar.net - The ambassadors of Saudi Arabia Ali Mohammed al-Hamdan and Egypt Mohammed Mursy Awadh to Yemen on Wednesday paid a visit to the Chamber of Commerce and Industry I Hadramout and met there chairman and members of its board of directors and a number of businessmen and investors. Almotamar.net - The specialised press course, organized by the Saudi Information Ministry in cooperation with Emir Ahmed Bin Salman Institute for Applied Media, in which 14 Yemeni journalists received training, has been concluded on Wednesday. Al-Attiyah affirms good results achieved in pledges and projects.